We perform wind load tests according to current standards on for example roof constructions. When you need project management, contact us. We use the Six Sigma methodology. Full scale training packages or short seminars, what ever you wish for we deliver. We arrange Hot Work training and issue belonging certificates. Comprehensive windload calculation tool according to EN-1991-1-4. Designed for OEM, engineers and roofing contractors. 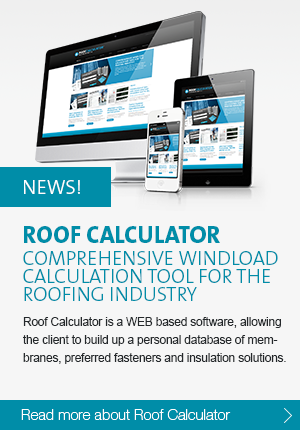 RoofCalculator is unique due to complete integration of 28 national annexes. Constructech will participate in the AMI conference for waterproof membranes 10-12 december 2013 in Düsseldorf. During session 2 - Fixing roofing membranes we will talk about "Wind load calculations according to Eurocode EN1991-1-4 in practice". We will also display at the exhibition space. Constructech has invested in a Kesternich test chamber. We perform tests according to ISO 6988 and DIN 50018. Kesternich tests are standard procedure within the building and vehicle industry. Sintef Buildning & Infrastructure, Intron Certificatie and SP Sitac approve Constructech as test laboratory performing wind load tests according to ETAG-006 / EN:16002-2010.